Fourth Dimension: Animator on a killing spree ! Animator on a killing spree ! Warning! Warning! …Look out for this ‘One Man Army’ who has let loose his imagination and is on a killing spree. Not in real life but in an animation movie. 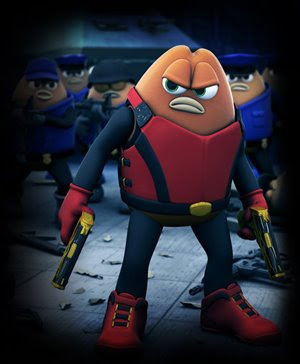 Jeff Lew, the lead animator of 'Matrix Reloaded', has finally finished his movie ‘Killer Bean Forever’ and will be releasing it soon in DVDs. He has just released the release date(June 2009). Jeff Lew has made this movie all by himself, well…. almost. He has spent around four years from concept to completion of this movie. Gutsy! Jeff Lew is currently working on Transformers 2. Surf over to his site for more info.